Credit Score Changes - How often does it happen? Home / Credit Repair Blog / Credit Score Changes – How often does it happen? Working to improve your credit score? Be patient – Credit Score Changes are something that happens overnight. No, you have to work at it, which is why it’s important to think of credit repair more as a process than a quick fix. However, with that being said, it’s not out of the question to see slight improvements (or reductions) to your credit score on a month to month basis. Here’s a closer look at how often credit scores change, and why they do. Your credit score is based off of your credit report, which is a detailed history of your lending and consumer habits. How often are credit scores calculated? Usually when they’re requested by a lender. However, it’s worth noting that any lenders you’re working with will usually report to credit bureaus about once a month, disclosing things like the timeliness of your payment, your account status, your account balance and any other activity. 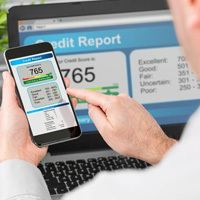 It’s this reporting that can either help or hurt your credit score on a month to month basis. Any delinquencies: Payment history makes up 35 percent of your FICO score, the single largest category. Hence, it’s important to make on-time payments. That said, should you fall behind on a payment, even for just 30 days, your credit score could be docked significantly. Debt: About 30 percent of the credit score is based on debt owed. Generally speaking, you’ll have a better credit score if you keep debt owed within 30 percent of your total credit allotment. That means that if your debt load increases, your credit score will likely drop. Conversely, if your debt load decreases, you could see a significant boost. Legal dispute: If you’re in a legal dispute, it’s likely that the judgment will land on your credit report, dropping your credit score significantly. We’ll say it again – credit repair is a process. And while small fluctuations can occur on a month to month basis, the best way to improve credit is by developing a debt management and credit repair plan and sticking to it. This might include paying down high interest loans or credit cards faster than others, setting payment reminders or automatic payments to ensure on-time payment and watching how much you charge to your credit cards. While your credit score can change on a monthly basis, seeing any significant change can take up to several months.